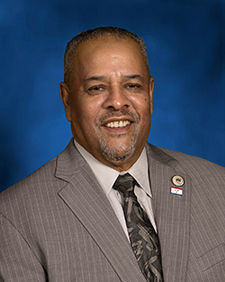 John Harold Bagneris (born July 1950) is an African-American Democrat member of the Louisiana House of Representatives for District 100 in eastern Orleans Parish, Louisiana. On January 11, 2016, he succeeded Austin Badon, another New Orleans African-American Democrat who was term-limited. To win the position, Bagneris defeated in the general election held on November 21, 2015, another Democrat, Alicia Plummer Clivens (born 1959), 6,662 votes (54.9 percent) to 5,150 (45.1 percent). Clivens oversees the reopened New Orleans East Hospital and formerly worked in the administration of then Mayor Ray Nagin. In the campaign, Clivens charged that since 1993 Bagneris had accumulated more than $206,000 in federal and state tax liens: "He can’t pay his own tax bills. Why trust him as state representative to help you with yours?”, her mailer read. Bagneris spent twelve years as an aide to Democrat African-American former state Representative Louis Charbonnet. He has also managed Charbonnet's transportation company for some thirty years. Bagneris' brother, Civil District Court Judge Michael Bagneris, ran unsuccessfully for mayor of New Orleans in 2014 against Mitch Landrieu, who left the mayoral office in 2018 after two terms. Bagneris drew the backing of the African-American political groups LIFE begun by the late Mayor Ernest Nathan Morial and the 7th Ward organization called COUP. In March 2016, Carter joined a House bipartisan majority to enact a one-cent increase in the state sales tax. State representatives voted 76 to 28 for the tax hike, a part of the revenue-raising measures pushed by new Governor John Bel Edwards. A House and Senate conference committee subsequently trimmed the duration of the tax from five years to twenty-seven months, effective from April 1, 2016 to June 30, 2018. Even the sale of Bibles and religious publications and Girl Scout cookies are now subject to the tax. ↑ John Bagneris, July 1950. Louisiana Secretary of State. Retrieved on April 3, 2016. ↑ John Bagneris. ballotpedia.org. Retrieved on April 3, 2016. ↑ Jessica Williams (November 21, 2015). John Bagneris wins New Orleans East House race, despite attack over unpaid taxes. The New Orleans Times-Picayune. Retrieved on April 3, 2016. ↑ Della Hasselle (October 24, 2015). John Bagneris and Alicia Plummer Clivens headed to runoff in House race to represent Eastern New Orleans. The New Orleans Times-Picayune. Retrieved on April 3, 2016. ↑ State House of Representatives Vote to Increase Sales Tax. KEEL (February 25, 2016). Retrieved on March 28, 2016. ↑ See the list: Examples of goods, services that'll now be taxed in Louisiana. The Baton Rouge Advocate. Retrieved on April 1, 2016. This page was last modified on 3 February 2018, at 21:24.